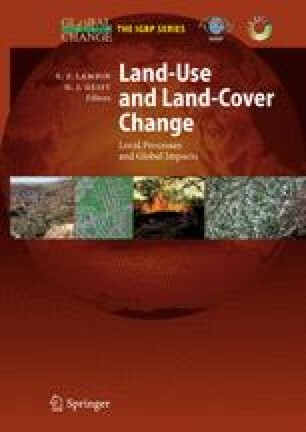 Much of the scientific research concerned with land-use and land-cover issues is motivated by questions related to global environmental change. For example, will deforestation continue, and if yes, where, and at what rate? How will demographic changes affect future land use and cover? How will economic growth influence future land use and cover? What will be the magnitude of emissions of greenhouse gases related to land use and cover? A common characteristic of these and other issues related to global environmental change is that they stimulate questions not only about past and present changes in land use and cover but also about their future changes (Brouwer and McCarl 2006). The main objective of this chapter is to summarize the state of understanding about the future of land. What are the range and predominant views of this future? What are the views on the global, continental, regional and local levels? We review what (we think) we know and don’t know about the future of land by reviewing published scenarios from the global to local scale. Our aim is to identify the main messages of these scenarios especially relevant to global change issues, and to recommend how scenarios can be improved to better address the outstanding questions about global change and land use/cover.